Before I had children I didn’t even know how to spell “rhythm.” I had gotten used to doing whatever I wanted whenever I wanted as a single person: making my own schedule where I could paint 24 hours straight and sleep for 12 hours every other day; loving my footloose and fancy-free life of being an artist, teaching art, traveling, backpacking, being self-employed and scheduling all my work to start after noon. Little did I know then how much I would come to appreciate yearly, weekly, daily and even smaller rhythms that would come to support my life and our family. When I was new to becoming a parent, I kept striving to maintain the life I had before having kids. Staying up late to make art, selling art at art shows while I strapped my kid to my back, performance painting on stage while my kid slept in the stroller next to my easel, and doing my best to continue being an artist, mother and wife. There was a part of me that knew to still embody some sort of rhythm through the constant state of flux and flow of an artist’s life and being a new mom. I made sure that we had breakfast every morning around 8 am, lunch around noon, and dinner around 6 pm. Nap was at 2 pm, and bedtime at 8 pm, no matter where we were traveling and what we were doing at any given moment. This gave some form to the constant change of surroundings. I realized how much this helped my son and myself, even though I didn’t really want to get up at 7:30 am every morning, make breakfast and be “on” when I had gone to sleep sometimes only hours before. Did I mention the word “striving?” This baseline of rhythm did not happen every day because I was exhausted and still learning how to do the most basic tasks while having a young, nursing child, far from support of family and friends. I continued to strive to meet this baseline rhythm because when I was fed and I napped at regular times with my child, I noticed that I was more capable of responding to his needs instead of reacting. Even though there was a part of me wanting to rebel from a schedule because I wanted to be ‘free,’ I realized by having a rhythm to the day, I was truly free to flow in a new way. The years rolled on, and we found ourselves on a biodynamic farm in Washington state. It was here that I really started to embody the more seasonal rhythms that naturally occurred by living on a farm, and our son started going to a Waldorf preschool that had seasonal festivals. Having grown up in southern California, we had very little connection to the seasons, due to very little change in the weather except warm and warmer with two weeks of rain in December. I didn’t grow up planting anything or having any seasonal rituals, other than the ones I grew up with in church and popular culture. I could sense something was missing. Shortly after we moved from California to Washington, we went to the Waldorf School for a Michaelmas Festival, and I was in awe of all the elements of honoring and welcoming the fall energies, such as bobbing for apples, spinning wool, metal smithing, celebrating the harvest and slaying your inner dragon as you fortified yourself for the coming darker months and winter. On the farm, we made the horn manure biodynamic preparation 500: stirring a pile of manure for an hour while singing, mixing in herbs, sweat and spit; packing it in a horn and placing it in the ground to rest and digest over the winter until spring time. This was all very new and inspiring to me. We started tucking in the garden beds and planting crops that would overwinter as the leaves were falling and the temperatures were dropping. By the first week of November the ground was frozen solid and the temperatures were in the 20’s and teens. Never had I experienced a fall or winter like this before. Naturally we focused our energies more inside, processing the fall harvest, making medicines, making cheese from the cows’ milk, baking homemade breads and pizzas, making sure the animals’ water was thawed, putting out food for the animals, scooping poop out of the barn where they were sheltered, making crafts, painting, playing games and starting our first weekly rhythm chart. There was the daily rhythm of morning chicken and cow chores; there were weekly rhythms like Friday pizza and game night. We grew and made everything on the farm for the pizzas and hosted games at our house for all the kids that lived on the farm. I noticed that our son also looked forward to this time with anticipation and loved helping to make the pizzas: prepping the dough the day before, making cheese from scratch, chopping the veggies, rolling out the dough and putting the pizzas together. The other two families on the farm would sometimes make their own pizzas as well, and we would all come together to eat and taste each other’s, along with playing SET, UNO and Catan. I wanted some way to delineate the weekend, so I started Saturday night spa night with candlelit bathtubs, special bubbles and essential oils, live guitar music by my husband, and oil massages after bath time. This gave me a sweet way to nurture myself and to connect with our son in a special way. It also helped me to feel like a weekend happened when farm life and chores made each day feel kind of the same. Spring rolled around and I finally understood something that I had read on the seed packets for years in California… plant the seeds when the ground has thawed. 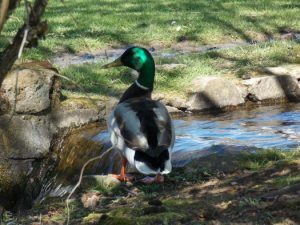 I had no idea what that meant and would stick my hand in the earth in California and wonder, “I think it is thawed.” Now I knew – when the ground isn’t frozen like an ice block and the soil can be worked! I loved seeing the seeds that were planted in the fall surviving and thriving. It was magical witnessing the hundreds of garlic plants emerge beautifully, after having sown them at 5 am the previous fall (optimal root time). There certainly is something miraculous in biodynamic farming! This experience of tuning in with the astral energies and channeling them down into the ground made growing food more connected, whole, holy, abundant and thriving. I loved that our son was being raised on a farm in connection with the land, seasons, animals, and cycles, as well as going to a Waldorf school that supported his head, heart and hands. We were able to live on this farm from the beginning of fall to the end of the following fall. Grateful to witness and participate in a full cycle on the farm, it was then time to move again and we landed in Asheville, North Carolina so I could go to midwifery school. There is nothing like moving across the country from a rural farm to the middle of an urban town with a 4.5 year old son, going to school full-time and being pregnant with our second child. Needless to say, it was a big transition for all of us. 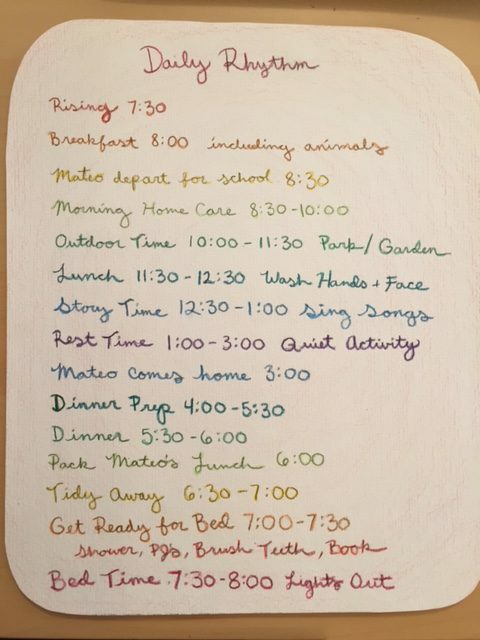 That summer after I graduated with birthing and catching our second child at home unassisted, I created our first drawn-out weekly rhythm chart that gave form to the formless post-second-child days. Really, all I wanted to do most was to keep sleeping when the baby was sleeping. There was still much reading of books in bed with our oldest, so I could still be restful. I found that by planning the week out we could all look forward to what was to come, and I had an easier time organizing and preparing for the days ahead. A big part was having a theme for dinner every night. This helped me know what needed to be shopped for on a weekly basis, and I wasn’t scratching my head every night wondering what to make for dinner. Taco Tuesday has been going for five years solid. Everyone knows what to expect that night and having a regular rhythm of food has helped my more finicky eater. This chart’s aim was to include activities that would nurture the four lower senses of touch, life, movement and balance by including baking, swimming, hiking, handwork, art, dance, and science (which was mostly experiments with things in the kitchen like cornstarch, water, vinegar and baking soda). Touch was nurtured by the rich sensory environment in our home (beautiful toys, handmade of natural materials) and by intentionally including opportunities for age-appropriate sensory exploration (baking/science, swimming, outdoor time, etc.) Each day having an in- and an out-breath of activity nurtured all senses, but especially the sense of life. The sense of self-movement was nurtured by adequate playtime, both indoors and out, as well as regular art, dance, and baking/science activates. I supported the children’s sense of balance by providing ample play opportunities, carrying/wearing them, and playing movement games. Our son would ask over and over again if we could go to the library every day of the week. He still asks now, when he is almost 10, and he gets the same answer, “Library day is on Thursday,” (Monday now in 2017). This gave him a place to put his expectation and anticipation. By giving him the same answer, he could rely on the structure and form of the week. It also helped me to feel saner and to stand in confidence that everything has its time and place. I had him help me decide what was going to be on each day, also empowering him to take ownership of what happened and what he was going to eat. I included on the chart a couple of chores that were weekly in nature like changing sheets, cleaning the bathroom, cleaning out the fridge, and taking out the trash. This helped me remember and avoid feeling overwhelmed by trying to do it all in one day. We kept this chart on the fridge for a couple years. The daily flow changed when he went to kindergarten five days a week that fall, but the dinner and weekend rhythm stayed relatively the same. The following year, when he was homeschooled, we had another flow that was on the reverse side of this chart to include activities that he did during the week like forest floor kindy Monday and Friday, horse archery Tuesday, a local flora and fauna hiking class on Wednesday, and library day on Thursday. I did this while having his one-year-old sister with us. The following year, he entered first grade and was at school for a full day so the chart was less active for that year and for second grade with some elements like dinners and weekends staying the same. Farmer’s market on Tuesdays followed by tacos at our house was still something the kids loved and looked forward to, especially since it became a class activity after school on Tuesdays, with his teacher often coming, too. In the spring of his second grade year, I gave birth unassisted to his second sister and started the LifeWays Training. This choice to be in LifeWays was motivated by having our third child and planning to homeschool our middle child the following year. She had been in the nursery four mornings a week so I could be at work. Having a third child meant that I would not work outside the home, and this changed my need to have our second child in a nursery program. Knowing I would be home with two young children, I wanted to gather more tools for my parenting/life toolbox to help raise and homeschool our children. I was excited to make another daily and weekly rhythm chart as part of my homework and to help support me in my daily life with three children. After having our third child, there was more need for our oldest son to be motivated and follow through with getting himself ready before school in the morning. We identified the nine steps he needed to accomplish before getting picked up by the carpool. He created his own morning rhythm chart, writing and illustrating each step so he could check and see if he had done all that was needed. This helped our morning flow tremendously since I was still lying down with his newborn sister. He used to get up and look at books and not do anything to get ready unless we were asking and motivating him every step of the way. Now he gets up and quickly does all he needs to do. He would often reference the chart as he went, but now it is part of his internal guidance system. Now rhythm is an integral part of both my vocabulary and my family’s. 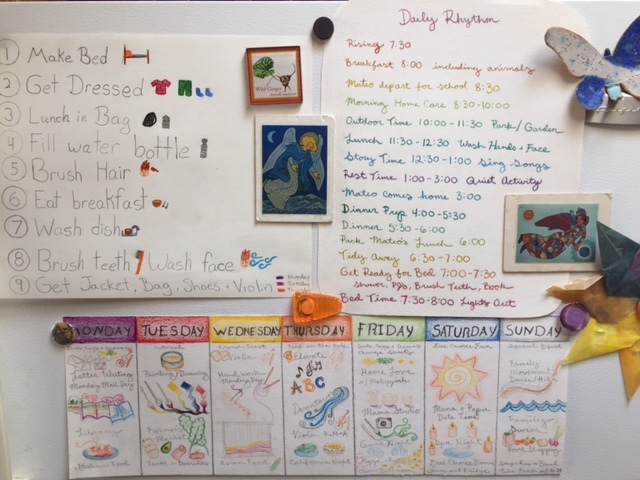 Our children have often taken down the chart from the fridge with reverence and pride to show friends and family who are visiting, pointing out their favorite days and activities. Our family continues being involved in farm life as much as possible on our urban homestead. We tend chickens and collect eggs, plant and harvest according to the biodynamic calendar and watch and listen to the land that we tend. We continue following a daily and weekly rhythm. In the larger community, we continue to enjoy seasonal festivals and celebrations. Through my own biography, and in particular through an experiment with words, I’ve become convinced of the importance of an intentional, healthy rhythm throughout my home life and continue to strive each day. Dahlia Moon is a mother of three, living in the mountains of North Carolina, and is a recent graduate of LifeWays. In her life, she blends her experience of child birth and child rearing with her work as a birth attendant and massage therapist, as well as an art teacher. Adaptive and curious, she is has trained and is knowledgeable and in many other modalities such as movement therapy, healing, and culinary arts which she brings into the different aspects of her work. She is striving to offer to others a possibility of finding and supporting their own natural way to be a creative parent.